This all new DVD brings takes viewers an exciting journey through the music and life of the revolutionary Austrian composer, Arnold Schoenberg. With Schoenberg's UCLA lecture in the background, the viewer is immersed in Schoenberg's music, which also serves as a guide to understanding the abstract, and often critical, concepts of Schoenberg. Starting with his earlier concepts, the video examines the evolution of Schoenberg's thought, from his earlier efforts to preserve a decaying musical disposition due to nostalgia, all the way to his ideas of establishing new methods of musical organization. 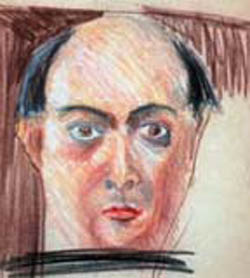 The video examines Schoenberg's struggle with his classical background, and the his experimentation with atonality, which would eventually lead to his twelve tone row. With never before seen photographs, period footage, and manuscripts, this DVD provides a candid look into the methodology and concepts of one of the most important musical figures of the twentieth century.